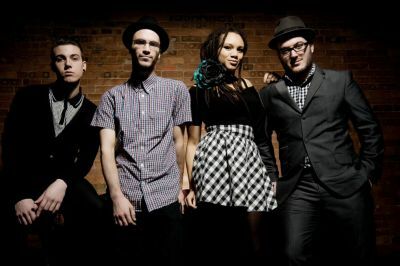 East London’s The Skints were welcomed with open arms on Friday at the Dance/Lock-Up Stage at Leeds. We caught up with Marcia Richards (Keys/Sax/Flute/Melodica/Vocals) and Josh Waters Rudge (guitar/vocals) straight after their ska/reggae/punk shenanigans on stage. “This [ska] scene is amazing and the people are amazing.”S] Welcome to Leeds, are you happy to be back? S] You’ve toured with Northern English ska bands such as Random Hand [from Keighley], how much do you agree that ska music is a nationwide genre rather than just an underground London scene? S] Your latest album ‘Part & Parcel’ was developed in a unique way. Could you tell us how that happened? S] You completely rocked your set today, were you pleased with the turn out? [The Skints played the Dance/Lock-Up Stage on Friday at Leeds]? S] You recently played the Hackney Weekend in East London, coming from that area yourselves, how much do you agree the area is thriving? S] We heard about your van being stolen a few weeks ago along with much of your equipment. The punk community turned out in force to help you out to raise much needed funds, how did it make you feel to know that there is a lot of support out there for you? S] And so what are you immediate plans after Leeds Festival? S] Finally, if you were in a Zombie Apocalypse, what weapon would you use and why? For more information visit the official Skints website.